The goal of the Alpha Omega Alpha Honor Medical Society at UNM is to promote service to others, support the ideals of humanism, and to recognize high educational achievement. The current New Mexico Chapter AOA Councilor is Satyan Shah, MD (Associate Professor of Surgery). The Office of Medical Student Affairs provides administrative support to AOA. For more information about AOA, please contact OMSA at HSC-OMSA@salud.unm.edu or 505-272-3414. Election to AOA is indeed a great honor. The process at UNM begins early in the 4th year of medical school. During the summer, approximately 25% of the expected graduating class will be nominated for AOA. This nomination will occur primarily based on academic performance (Phase I and Phase II grades). Nominated students will be notified and will be requested to provide consent for the AOA selection committee to review their academic records. 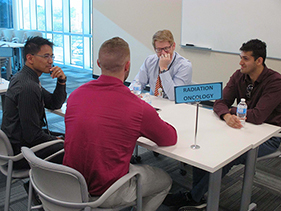 In the summer/early fall the selection committee (consisting of faculty and resident members of AOA at UNM) will meet to review all nominated students. The committee will elect up to 1/6 of the expected graduating class. Final selection will be based on academic performance, leadership capability, ethical standards, demonstrated professionalism, record of service to UNM and the community at large. *Students may add AOA nomination to their Residency Application and CV. 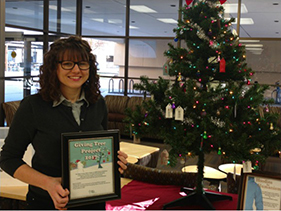 Every winter the Chapter sponsors a “Giving Tree” where charities in our local community are donations of food items, clothing, or other needed items. 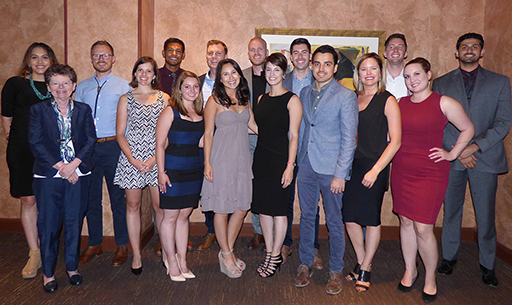 Every spring, AOA holds an induction banquet to welcome the newest AOA members. All AOA members are welcome to attend. For more information about the Spring Banquet, please contact AOA coordinator Chamonix Berry at CBerry@salud.unm.edu or 505-272-0648. The newest addition to our AOA Chapter’s activities, the AOA Specialty Career Night is held in the Spring and provides 1st and 2nd year MD students with the opportunity to meet with faculty and residents from various specialties outside of their core curriculum, giving students the opportunity to explore their interests early and in a casual setting. The New Mexico AOA Chapter issues a bi-annual newsletter to members which includes information about upcoming events and elections. The New Mexico AOA chapter has a long history. The first banquet and installation ceremony was held on June 4, 1968 in the Basic Medical Science Building. At that ceremony, 4 students were elected to AOA. Dr. Reginald Fitz, the Dean of the Medical School, presided over the program. To date, over 650 students, residents, and faculty have been elected to AOA at UNM. Were you elected to AOA at UNM? We would love to hear from you! Please consider attending our annual spring banquet. Please contact Satyan Shah, MD (AOA Councilor) at SShah@salud.unm.edu or 505-272-6428.